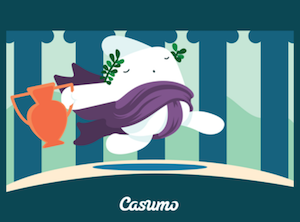 A new week has started and you should be heading over to Casumo right away. This week offers you free spins on a brand new videoslot from NetEnt. Actually it’s a progressive jackpot slot called Divine Fortune. This means that you can win more money than you can imagine in one single spin! As you probably already know this isn’t NetEnt’s first jackpot game. Some of the most famous titles in this category with casino games are Hall of Gods and Mega Fortune – two slots you can look forward to at Casumo. If you prefer playing your favorite casino games on your mobile or tablet there’s another reason to visit Casumo. During the EGR Nordics Awards 2017 Casumo was rewarded with the prestigious title “Mobile Operator of the Year”. Until 23:59 on Tuesday the 24th of January you can make a deposit to your account at Casumo and grab free spins at the same time. As usual you can choose between three different offers. Just keep in mind that wagering requirements apply and that you have to be an active player in order to claim this offer. This means that you’ve done at least one deposit or that you’ve played for real money at least one time during the last 30 days. If you deposit £10 you will receive 15 bonus spins, if you deposit £30 you will get 50 free rounds and if you deposit £50 you will get 100 free spins. It doesn’t matter which offer you claim – all the spins are available on the videoslots called Fruitwarp Wins. Don’t forget to log in at Casumo on Thursday the 26th of January. There are 5 free spins waiting on you on Divine Fortune for free! After that you can make a deposit if you want 20 more bonus spins on the same jackpot game. This offer is available until Friday the 27th. The fun continues on Wednesday the 25th of January. Log in at Casumo at 20:00 CET for a new Reel Race event. It all works the same as it usually does during the tournaments at Casumo. Except that the 1st prize is doubled. So the lucky winner with the most points will get £2000 instead of the ordinary £1000. If you don’t win anything on Wednesday you will get a new shot at Thursday at 20:00 again. The Reel Races will take place on the new jackpot game Divine Fortune!